Is it my imagination or are puzzles becoming more and more difficult as we approach the end of the year? Another almost carte blanche! 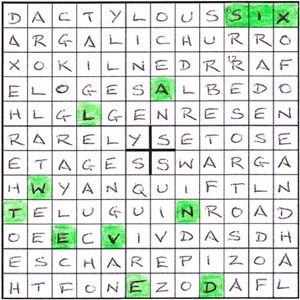 We know Artix has a reputation for providing toughies so we approach this with trepidation but notice with relief that there is conventional clue-numbering and that we will be able to divide our grid into six letter units to fit in those answers. 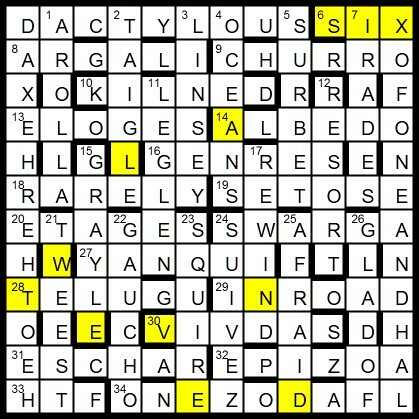 We are even given the useful information that there is a 24 down and a 24 across which helpfully pins down the centre. I take a deep breath and scan through the clues to check that Artix is still a member of that elitist Listener compilers’ imbibers fraternity (I know he is a connoisseur of fine wines) but, oh dear, I almost reach the end of his clues before, with a sigh of relief, I find ‘Rum chaser, ask Jeeves perhaps’ (yes, of course, that RUM was actually an anagrind indicator but it was reassuring all the same!) So we ask the SEARCH engine Jeeves, but, of course, soon learn that we have to anagram that to get ESCHAR. We are cold solving for quite a while before useful words like SUIVEZ (As instructed by conductor, follow quartet visiting seaport – IV in SUEZ) intersect with VIVDAS (With trace of Donkey found inside, examines meats treated offshore – VIVAS round D(onkey)) and we are at last able to create the skeleton of a grid. 12 is a kind gift ‘During break from work, men may go here’ (RESORT) but, ominously, tells us that twelve of our solutions need to be resorted or jumbled before entry and we keep on forgetting that and triumphantly putting the solution WAR GAS, (after revolution drop cruel chemical weapon SAG RAW<) when we need to anagram it to SWARGA to fit our developing grid. RISQUE for SQUIRE, DOABLE for ALBEDO and so on. Thus we struggle towards a full grid and light dawns. What was that strange title? ONEPO? Aaaah! That’s five eighths of ONE POUND isn’t it and wasn’t that TWELVE AND SIX in the old currency? So that is what the sixes and twelves were all about and now we have to find it in the grid and highlight it. There are two Es in column six but Artix has kindly told us which one to highlight and the same for the three sixes in column ten. What a challenge! Many thanks, Artix. Last week saw the final farewell to Radix, creator of some of the most fantastically complicated puzzles in Christendom — and last week’s was certainly no exception. Apparently his early puzzles featured in the very early days of the EV in particular. I’ve no doubt his work was important in establishing that series. He’ll be missed by many, setter and solver alike. The Listener world has plenty of other setters ready to take up the mantle. Artix has gone a step further than most and made sure to have an “x” in his name. Listener solvers will have seen his work a few times before, in his 2012 debut (Golf and Teddy Roosevelt) and as the “R” in Rasputin the same year (featuring a circular grid and Rupert Brooke). I solved neither of them. And he has a part to play in the background of many other crosswords too: adviser, test-solver, helper, co-setter… at any rate, I’m familiar with his work and unique style. So I was looking forward to this one, although I thought it might turn out to be rather tough! 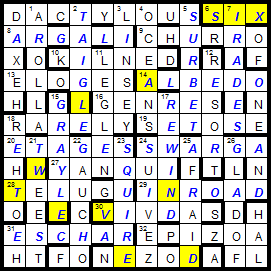 This week things seemed a bit more accessible, at least, and once we’d worked out what “12ed” meant it seemed that it was going to be an otherwise standard grid fill with normal clues, etc. Something of a relief! The six-letter answer thing promised for a fun construction, too — especially with the added 90 degree symmetry. I think last year Shark wrote a similar “only six-letter answers” puzzle for the EV series; although there the six-letter theme wasn’t made explicit in the preamble. In the end, I only properly came to this on Sunday, and it took quite a while to solve clue 12! That made working things out a bit tricky, to say the least… still, eventually it became clear that 31 SEARCH might have to be entered as something else to fit with its crossing entries, and that something else was an anagram, namely ESCHAR (how lucky that Ifor’s recent puzzle taught us all the anagrams of Search!) And with that (about an hour or so’s solving time) I was away. The rest was, mostly, pretty uneventful, a smooth ride to the finis through a cracking set of clues, the “search” one being probably my favourite for its tribute to a modern search engine (well, “ask Jeeves” anyway); also the (semi) &lit. in 21. Working out the grid shape was also not too bad, and came fairly naturally from the symmetry. Eventually, it was down to just a few gaps, and then finally there was just the mystery of 7. “Prised”, so after resorting it might be Prides. Yeah, I’ll go with that. So, to the perimeter. Not Prides after all, apparently, as it didn’t take long to realise that the ten-word phrase was “six of one and half a dozen of the other”. But of course. So IR?D?S instead, or (eventually) Raised (Rai + sed, a charade but an obscure one!) giving IRADES as the entry. And that 13-letter word was HEXADACTYLOUS, or “six-digited”, ie 6. Which leaves just the highlighting, and the mysterious comment about a link to the bizarre title and the initial grid. Probably took as long as the rest of the puzzle in some respects… until I realised that the initial grid was literally the grid we were given to start with, containing 12, 6 and four bars making a plus sign. “Twelve add six”, then — only that wouldn’t give a unique solution… so “twelve and six”. Sounds like something to do with old money, so maybe that’s the link to the title. Perhaps it used to be called a “po”? Or maybe not. It’s a mystery that may never be resolved… until another solve pointed out that 12s6d = 5/8th of “one pound”, or “ONE PO[und]”. Oh. Well… it’s the day after Christmas, and I hope you all had a Happy Christmas Day and will have an enjoyable and Successful Listener Year. It seems that I failed with Radix’s endgame last week: Robotics needed to be entered below the grid as the real title of the puzzle, rather than my Primordials. I’m afraid that, although Stiff Listener-like Special is a perfect clue to Robotics, as far as I am concerned, it represents what was missing from the puzzle/quotation, rather than what it was actually about. Ah well, c’est la vie. On with this week’s puzzle from Artix, his second Listener. His first, No 4211 One Shot at a Time, concerned the attempted assassination of Theodore Roosevelt, despite the fact that it looked like it was going to be about golf! It was a tricky puzzle, and I expected nothing less here. I’m afraid that time prevents a detailed blog, but suffice it to say that it was a devious little number. The reference in the preamble to clue 12 During break from work, men may go here was easy to solve, the answer being RESORT. Thus twelve answers would need to be anagrammed before entry. That provided a useful early bit of knowledge. So, the answer to 1 was AROLLA (ROLL in AA) and it eventually proved to intersect 8 Aggressor who’s extended muzzle to compel Capone, say, to hide one, which was GARIAL, resorted to give ARGALI! This meant that the square in the top left corner was isolated, as was every alternate square in the perimeter. The above sentence took about a minute to write, whereas it actually took me about three hours to fathom out. As the grid neared completion, it was the D and Z in the bottom row that enabled the little grey cells to resolve the perimeter as SIX OF ONE AND HALF A DOZEN OF THE OTHER followed fairly soon by HEXADACTYLOUS. That only left the single letter from each column to rationalise. Surprisingly, I stumbled on TWELVE quite quickly. AND SIX came a short while later. The title took slightly longer than it should have to get to grips with, but it turned out to be much, much easier for me than last week’s. Mind you, I needed to cast my mind back to pre-1971 days when pounds, shillings and pence reigned supreme in the UK. Back then, twelve shillings and sixpence, or 12/6 as it was written, was 5/8 of a pound… ie ONE POund. The 12 + 6 were also “all the elements seen in the initial grid”. I was surprised at how quickly I managed to rattle off some of these singles. 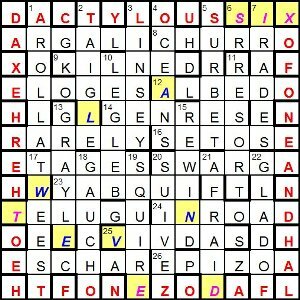 The acrosses 6 SOFA, 10 SOPPIEST, 12 PAILS and a few others could be entered, although their unchecked letters had to be withheld since one of them needed changing to produce a new word. Most had two or three options. Even SOPPIEST could end up as HOPPIEST, SOAPIEST or SOUPIEST, none of which I have ever used in a sentence in my life, despite drinking London Pride, washing up with Fairy Liquid and eating Crosse and Blackwell! The down clues also gave me half a dozen entries, so I was feeling confident. However, the double clues proved to be an absolute nightmare! The first one that I got was 7dn Dirk’s like in Ed’s bar: drink fortified wine and do something Amis put in shot (6) — at least, the second part of the clue was SHERRY, with ‘Amis’ changing to ‘amiss’. The first part was crying out to be CREASE (dagger), but AS (like) in CREE (?) didn’t seem to fit. Mind you, the entry seemed to be OSIRIS. Moreover, adding CREASE to SHERRY didn’t give any real word. Taking SHERRY away from OSIRIS didn’t work either. I decided to try and finish the single clues in order to reveal the source of a quotation with one word changed. 6ac SO·A had a lot of options, but most others just had two or three. 2dn ARIES and 3dn TOTTERS, however, could only be ABIES and TOTTERY, giving BY so it looked like we would also be given the author of the quotation. The last word GYTE could be GYBE, GYRE or GYVE, and GYRE looked the obvious choice giving R for the last letter of the author’s name. Luckily for me I have read a bit of sci-fi in my time, and it wasn’t too long before I put the M of AMMIRAL with the V of GYVE to see ASIMOV as the author. A quick check in my ODQ gave “The three fundamental rules of Robotics” from I, Robot ‘Runaround’. Changing Robotics to Mathematics seemed to fit the smattering of letters I already had associated with the last few double clues. It’s a great shame that there’s no phrase ‘very eventually’, because getting to the end of the grid took hours and hours. Moreover, I was running up against the deadline; it was Tuesday afternoon. 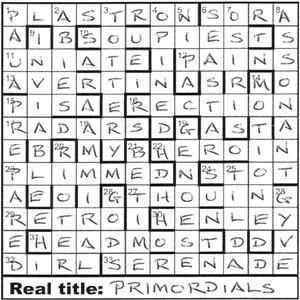 I was also getting worried about the “Real title” of the puzzle. It was obvious that it was cryptically defined by the given title, Stiff Listener-like Special. Early in my thoughts, I sussed that Listener-like meant ‘thematic’, and that fitted very well with ‘mathematic’. I was doomed! No matter how much I tried, I couldn’t get that out of my head. I tried all sorts of things in Chambers Crossword Dictionary and Mrs Bradford, but nothing seemed to work. Until, under stiff, I saw ‘prim’ and checked words beginning with that in Chambers. PRIMORDIAL jumped out, and I was ecstatic to see that audial was a word meaning “relating to hearing or sounds”. Add an S for ‘special’, and I was home and dry. It wouldn’t be wrong to call Radix’s last puzzle a ‘tour de force’. Fitting all the necessary words together in a grid that was symmetrical in so many ways was magic. 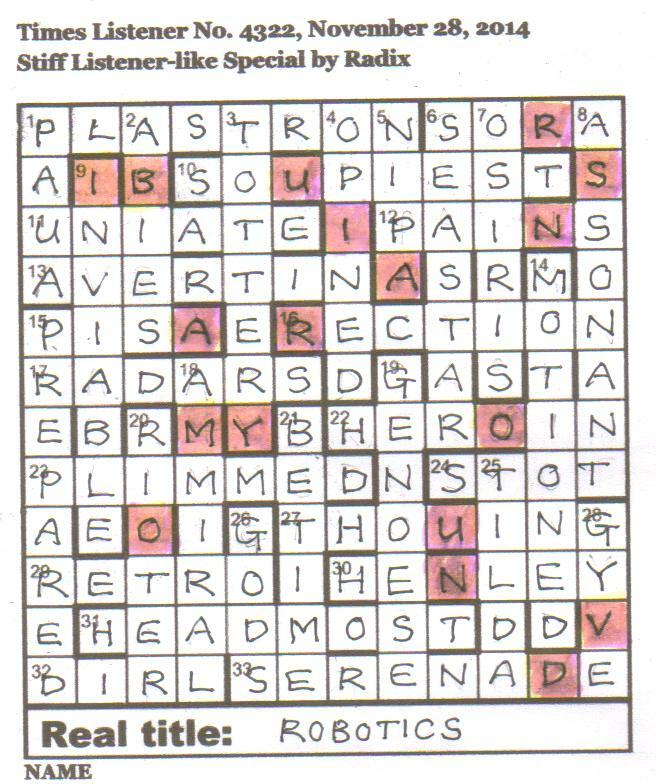 I suppose this puzzle certainly sorted the men from the boys, and I was left wondering what was the fastest solving time achieved. Thanks again for all the enjoyment over the years, Roddy. There’s a touch of Schadenfreude in beginning the very last Radix Listener: pleasure that it is there at all, yet sadness that he isn’t able to give us any more. He was almost the founder member of the Distinguished Listener Setters’ Oenophile League so I didn’t need to scan his clues to confirm his membership – but he did confirm it (of course) in style with five separate clues! ‘Dirk’s like in Ed’s bar: drink fortified wine and do something Amis put in shot (6)’ giving SHERRY and HANJAR that had to be added to give OSIRIS. 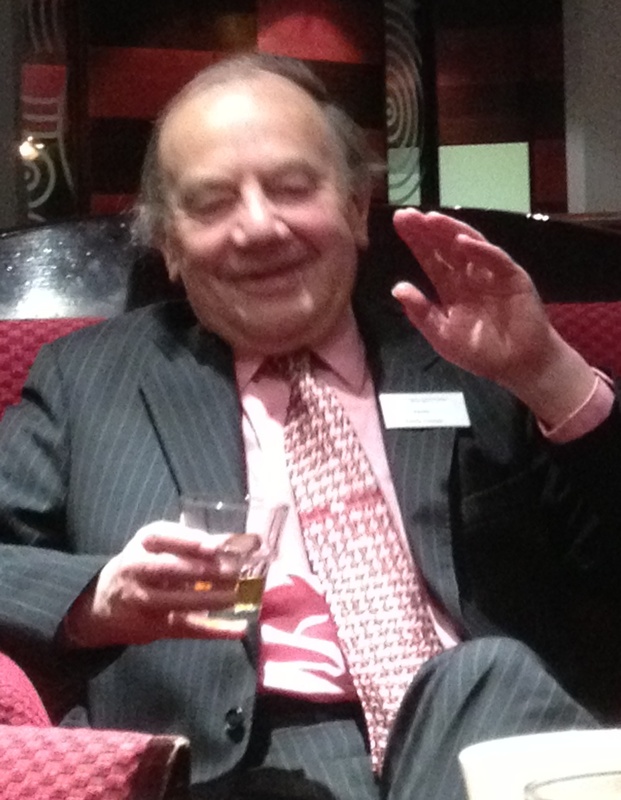 Let’s raise a last glass to Roddy – he did us proud! Even his title, this time, was reminiscent of a fine malt – ‘Stiff Listener-like Special’ by Radix – so we poured ourselves one and got down to the serious work of attempting to solve the clues, knowing that there was some sort of numerical treat in store for us at the end. We were colouring yellow the clues that were clearly ‘normal but each answer must be entered with one unchecked letter misprinted such that the entered letters, … in clue order, reveal the source of the quotation’ and, not surprisingly, as it turned out, we soon had sixteen yellow clues and a whole series of potential letters for misprints (but none of those difficult ones we later coloured orange). It was perhaps fortunate that we realized that the quotation was going to be ?????????? by ??????? and, when the other Numpty said “That looks like ASIMOV, we quickly checked in Wikipedia and established that the source was ROUNDABOUT by I ASIMOV. The ODQ provided only one ‘Roundabout’ quotation; the famous one about the three fundamental laws of robotics (which, of course, led us to the title ‘Stiff Listener-like Special’ (ROB + OTIC + S) so Roddy wasn’t prompting us to enjoy a double malt at all but hinting at what was happening in his crossword. Producing our solutions for the other half of the clues was tough. It was a good thing that some of the words like OSIRIS, SEA STARS, RADARS, GENOESE and HEADMOST were the only words available but we still had to virtually blind-solve the two clues, ‘side by side’ that had to be mathematically adapted to give us the entry. As solutions went into our grid, I suddenly realized that it was not ROBOTICS but ARITHMETIC that was appearing as our quotation and we took a lucky stab at THE THREE FUNDAMENTAL RULES OF ARITHMETIC, and an even luckier stab at our choice of addition, subtraction or multiplication, to decide how to combine the two clues. 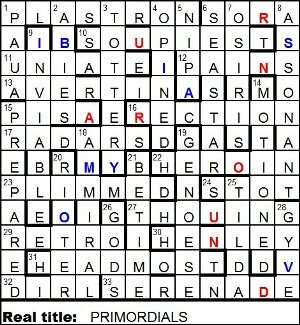 It was after some time and lots of flailing (with no efficient calculator – just a pencil and paper) that we realized that the appropriate method for each pair of words was the one that had not appeared in the clue so, if one of the pair of letters had been added and one subtracted, the method to adopt in the resolution of the solution was the third method – multiplication. Roddy is sorely missed – thank you Roddy for a fabulous finale!